As I look back, I’ve always fought love. I thought I understood it and what it meant, but I realize now I didn’t. Love… REAL LOVE… is like hopping on a train with no destination. You have no idea where the train will go, or where it will take you. But it’s okay, because you’re with someone you love. You feel safe, even though this journey has lots of ups and downs. Like life, it twists and turns. As with entrepreneurship, it feels more like a rollercoaster than a gentle train ride. You feel ALL the emotions. You have NO IDEA what to expect next. But it’s okay… because you’re beside someone you love (it makes sense). I haven’t been in love long, but since falling in love with Libby (just over a year ago of writing this), I realize it’s all I’ve ever wanted. Of course, I never admitted this in the past. I didn’t even realize it. And I’m starting to understand that it’s because I didn’t love myself. I think I built businesses and threw myself into the entrepreneurial hustle of 80-hour work weeks because I was trying to feel good about myself… I tried to feel worthy. Maybe this why many entrepreneurs build their empires. Maybe they don’t love themselves, so they build something huge because they have a chip on their shoulder. They identify who they are by what they have achieved, rather than what makes them… THEM. This was me. For a LONG time… this was ME! I recall a time when someone asked me what I loved about myself, `nd rather than think about who I was and what I loved about ME… I listed 20 accomplishments that had nothing to do with me as a person. I was incapable of loving myself, so therefore had the inability to understand (or feel) love. When I first saw Libby, I felt something inside me unlike anything I had felt before. I fought this feeling at first. I had no idea what to do with it. It terrified me! We trick ourselves into wanting control and being in control. But often all we have to do is LET GO. When I first met Libby, I had just blown up a successful business and was still figuring out what to do next. I let go of that business because it didn’t feel right. It made money, sure… but it didn’t fulfil me and I knew it never would. And I had to do the same when I met Libby and began to fall in love. I had to let go of the fear and allow myself to question all those beliefs that held me back… I had to question who Scott Oldford was! 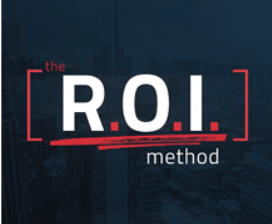 It was this that helped me create The ROI Method and build an 8-figure business that become 1MT. Without falling in love, I’m not sure I would have been able to do it. You can simply love your business and give your best. You can love the journey you’re on and strive to grow and be the best you can be. Once you let love in like this… you start to realize how easy it is to love everything around you. I’ve achieved some great successes in my life, and for a long time I attached myself to these. If I won big, I felt great. If I lost big, I felt like a failure. Today, I no longer feel this way. I now realize the best thing I have ever done is fall in love. Not just with Libby… but with myself. I cried for two hours because it suddenly made sense to me. Until I love ME… I will never be happy. I will never reach the destination. I will never be content with what I build. I will always want MORE! Since then, I’ve learned to love myself as much (if not more) than I do Libby. I feel more free than I ever have in my life. You may not think love and business are closely attached, but they are because once you let love into your life it spreads and grows, and touches every part of it. The thing is, you don’t NEED any of this. The only time you do is if you don’t love yourself… if you don’t feel worthy or enough. Once you do, you can let go of that pursuit of money, fame and fortune. You can let go of it and just be yourself, and commit to delivering the biggest impact on this world you can. I know it did for me. I have more of that stuff now than I ever have before, but the difference today is that it no longer matters as much. Why? Because I don’t base my success on my business… I don’t identify who I am as a person, with the businesses I build. I am much more than this! There is more to who I am then the businesses I own. There is more to ME than the money in my bank. I am not the complete article by any means, and I still have a lot to learn. But today I choose to LOVE myself and believe I am worthy. A business doesn’t give you any of this. Love for someone else, and love for yourself does. Your business is a vehicle that allows you to live the life you want to, so don’t think I’m saying it isn’t important, or that money nor fame is. It is important… but without love it means little! So if you’re still building the business you desire, and you’re not content with where you are… choose to love who you are. Embrace it and let it into your life, and LET GO of everything else. Because if you aren’t happy now, you won’t be happy when you’re rich!